Illustrated in full color by Liat Binyamini Ariel. Minor holidays? What's minor about days that are so enjoyable and have so much to teach? When Bina and Benny - and their favorite talking holiday dove - get to work, every special day in the calendar is interesting and exciting. So let's hurry inside the covers of this book and see where they take us. They'll show us Lag Ba'Omer and Tu BiShvat as we never knew them before. One thing is for sure: Lag Ba'Omer and Tu BiShvat will be more wonderful than ever. The ArtScroll Children’s Holiday Series by favorite juvenile author Yaffa Ganz is a new concept in Jewish holiday books. Brimming with information and beautifully illustrated in full color, each exciting holiday story makes learning a joy. 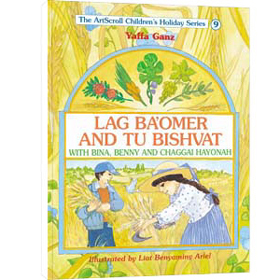 Bina and Benny and Chaggai HaYonah are a child’s ideal companions -- during the holidays and all through the year.